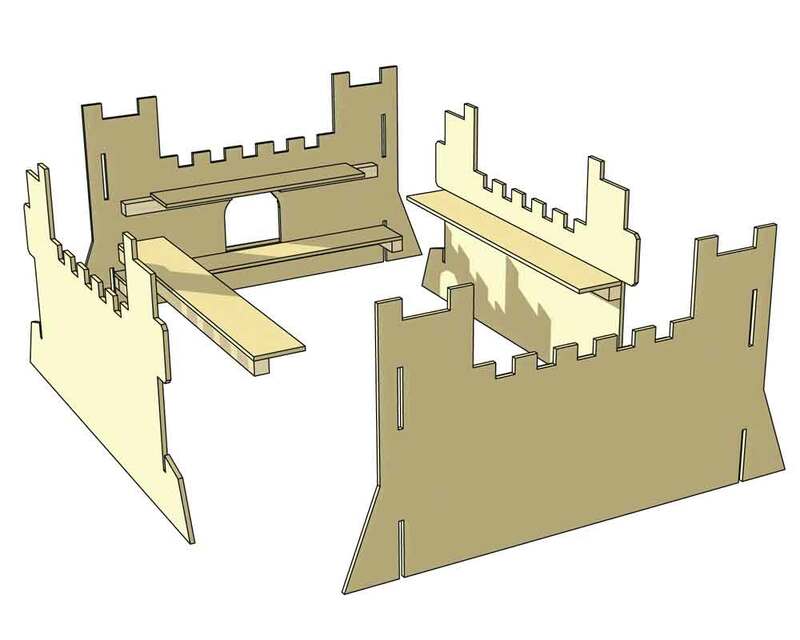 This project uses 6mm MDF or ply throughout which can be either sealed or painted when complete. 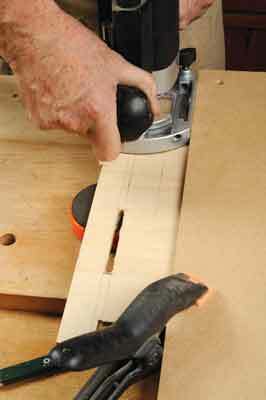 Cutting the board out oversize makes it easier to handle. 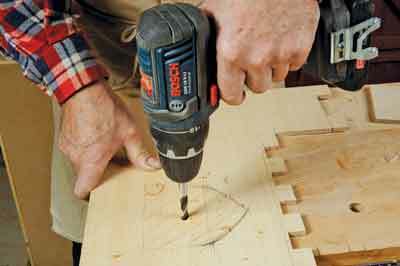 Carefully lay out the design using the plan as a guide. If you use the typical size of figure you can check the design looks in scale with them. 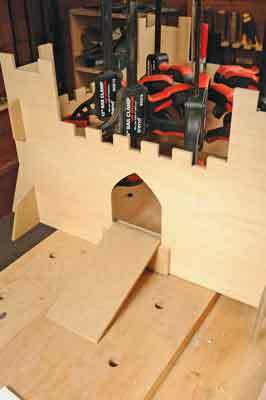 A bandsaw is the easy way to cut out the towers and crenellations. 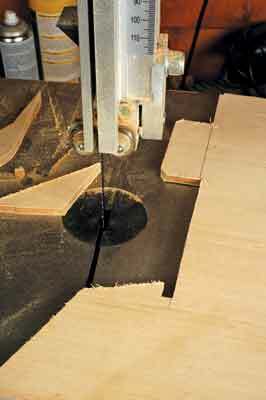 However, you need to be a bit ingenious with your cuts, including marking the reverse face as well so you can get under the bandsaw guides for all the cuts. 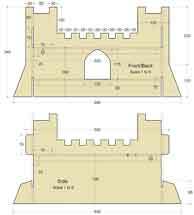 Carefully nibble out at the bottom of each crenellation. 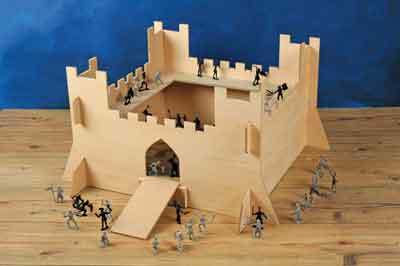 Don't worry if the cuts aren't perfectly straight, castles cannot have been in perfect order - especially after a few assaults by the enemy! 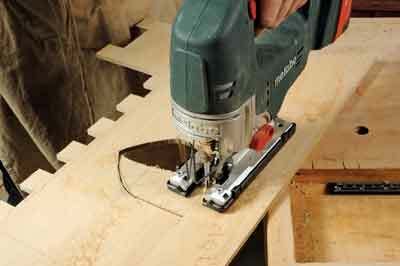 Drill an entry hole for the jigsaw so you can cut the arch shape. This is quite wide to allow for plenty of fighting underneath the imagined portcullis. 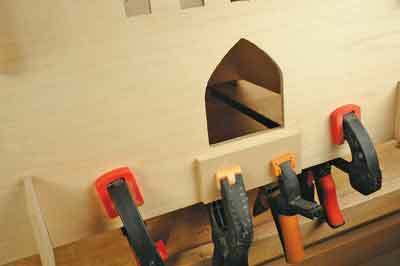 Try and get a nice symmetrical arch profile when cutting and tidy the shape with a wood file afterwards. The front elevation should look something like this. Get this one right and you can use it as a template for the other three sides. 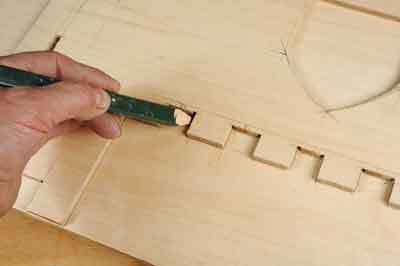 Mark out two slots that will allow the sides to clip together. 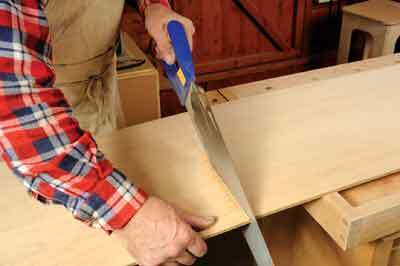 The board is 6mm thick and the cutter will be 6.4mm, which gives just enough movement without binding. 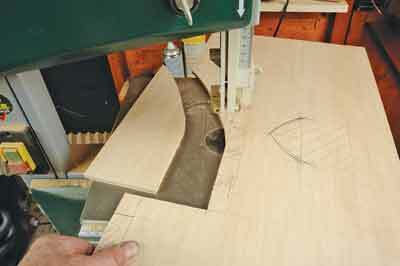 Use a straightedge or router T-square to make both through slots. 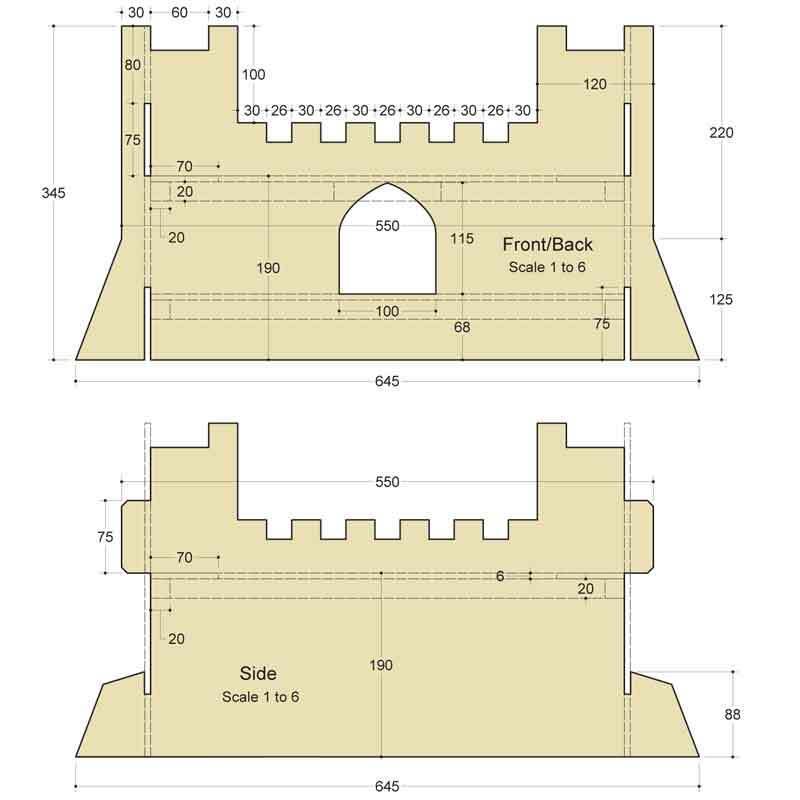 Keep them the same on both the castle back and front so they match. 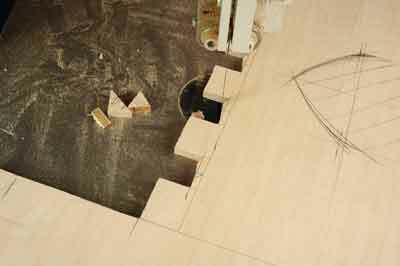 Now draw out the other three castle sides using the front as the template. 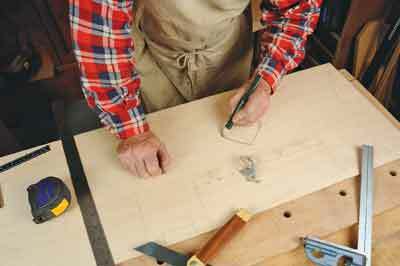 You can tidy the lines once the template is lifted off. 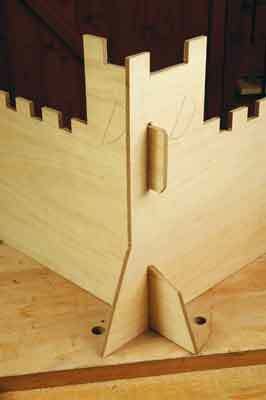 The adjoining sides to the front and back are different because they still need a buttress shape at the bottom which has a short slot for the front and back to hook into and a tab above which pushes through the upper routed slot. 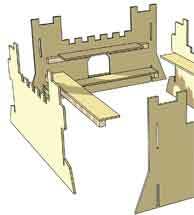 This will hold the castle parts together. 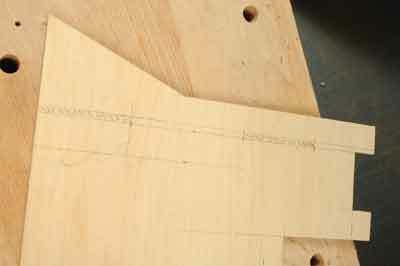 The tab at the top will need trimming to get a good firm fit in the slot but the resultant joints should look like this one. Mark all the joints so you know which goes where. These can be sanded off later with more discreet marking applied instead. 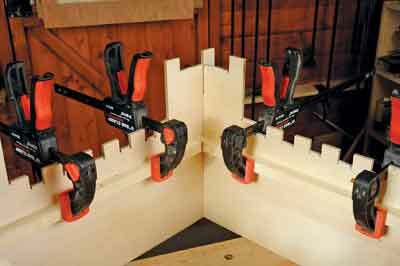 A small pad is glued on the front for the drawbridge ramp and 20 x 20mm batten glued across inside to take a walkway. 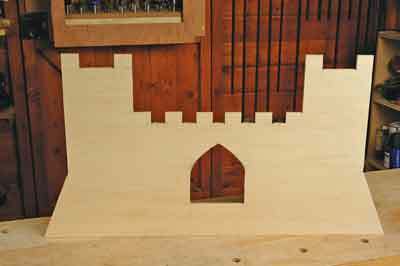 More 20 x 20mm batten is glued on to support the ramparts. The position should allow knights to see and aim weapons between the crenels (uprights). With the ramp in place, the last thing to glue in will be the walkway behind the arch.